Features a clam type opening/closing system, which is simple to use and has a high clearance for easy loading and unloading. 38x38cm or 45x38cm plate available. Time and temperature is electronically controlled from the integrated digital panel. Pressure is adjustable, via an easy to use top dial. The machine has a sleek and ergonomic design. The top plate is not rigidly fixed; which helps to ensure a uniform pressure between the upper heated plate and the lower loading plate. The lower loading plate is interchangeable. 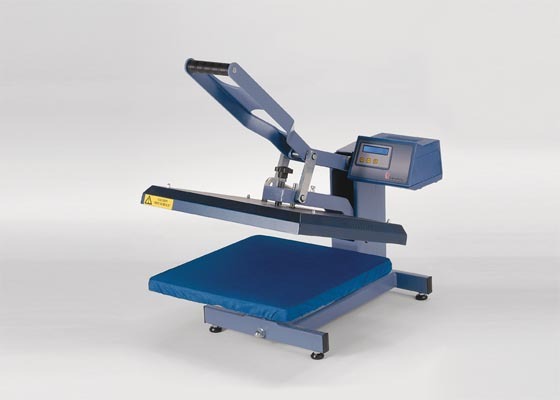 These transfer presses are manufactured in Europe so you can be assured they meet with the relevant EC machinery safety directives and the applied CE mark actually means something (unlike many far-eastern copy machines). Service centre based in Manchester UK.